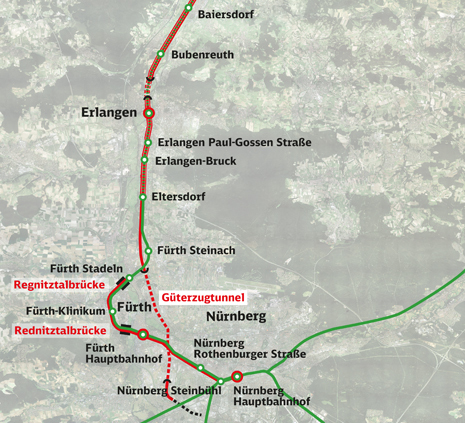 The freight line (5955) between the new Kleinreuth junction to the south of Nuremberg and the new Eltersdorf hub north of Fürth and Nuremberg will create a new connection for freight, which will no longer need to cross the increased passenger traffic between Fürth and Nuremberg. The passenger lines are currently crossed on the level. Crossing on the level will no longer be possible due to the passenger connections currently undergoing upgrading, the new clockface passenger timetable and the increase in the number of trains. A significant increase in rail freight is also anticipated throughout Germany. Furthermore, the modal shift of freight from road to rail, for which line capacity also has to be created, is being encouraged as far as possible. The new freight line also means that almost all freight trains from and to the north will no longer need to pass through the densely populated urban areas of Nuremberg and Fürth. The map below shows the planned trackbed and the animated video provides an initial dynamic impression of how the line will be integrated into the urban areas by means of its major feature, the Pegnitz tunnel.